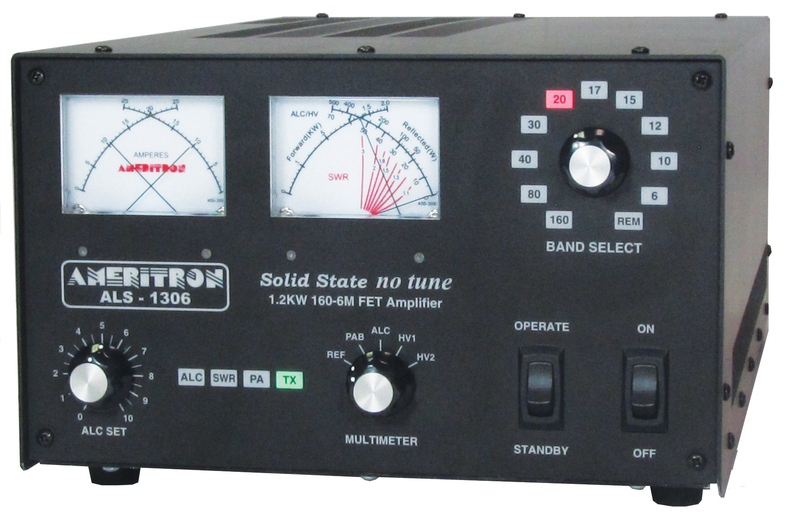 This review of Ameritron’s ALS-1306 was prompted by my selling my older ALS-82 in order to get a no tune amp. This will not be a technical review, as there are many of those around, and the amp is based on the older designed ALS-1300, with some protection added. I decided that I wanted an auto tuning amplifier, as opposed to the manual tune, AL-82 I was using. So I sold the old AL-82, (see my review here), and purchased an Ameritron ALS-1306. I was a bit worried when I bought the ALS-1306 for several reasons– to be totally honest, my main concern was that MFJ was the owner of Ameritron– the quality, and service reputation of MFJ worried me. I had always had good luck with MFJ on items I have purchased, (nothing as expensive as the ALS-1306 though), so I called Ameritron, (which has also been good luck for me as well), and discussed my concerns with them. I got lucky and Mike, (the tech who works on the ALS-1306s), answered the phone. I discussed my concerns with him, and he had a good answer for each one of them… So I decided to purchase the ALS-1306. Next I looked around for a place to purchase the amp, and discovered that DX Engineering had quite a sale going on, so I purchased the amp from them. 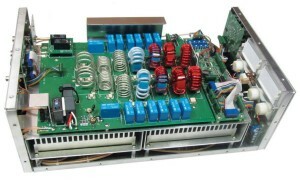 I have ALWAYS had good luck with DX Engineering, so I figured if the amp was a dud, I could return it, as DX Engineering has ALWAYS been fair in every way to me, and to everyone I have seen post on QRZ.COM as well. So I ordered the ALS-1306, and I also ordered the Elecraft K3 connector cable which allows the amp to follow the K3 band changes, and provides PTT for the amp, at the same time. The cable package arrived two days after the order, packed in a padded envelope, I opened it and then set it aside. The ALS-1306 arrived about a week later, packed in a very sturdy heavy duty cardboard shipping box. In fact, it was shipped in two boxes, both, inside a larger box, with the amp being in one of the smaller boxes, and the Power Supply being inside the other. Each device, (amp and power supply), had a plastic bag wrapped around it, and each device had closed cell foam inserts on the ends to hold the device in free space inside the smaller box. All in all it came very well packed, and would have taken a drop without damage to the case of either the PS or the Amp. Unboxing was fun, I carefully cut the top, then the sides, folded the end tabs out, and flipped the forty nine pound primary box over. I then slid the larger box off of the two other boxes. The piston effect was in play, as the two boxes fit very tightly together. Once that was done, I opened each of the small boxes separately. First the Power Supply, then the ALS-1306 itself. After removing the plastic wrap and inspecting each item, I found no damage of any kind. All was in perfect condition! Installation is a snap, you decide where you want the power supply, (I placed mine on the floor out of the way), where you want the amp, and then connect the five cables from the back of the amp, (power, control, coax in, Coax out, and if you decide to use it, ALC), to the appropriate devices. Cabling the amp took all of about 60 seconds… No issues of any kind. I was sure to leave cooling spaces around the exit slots on the left of the amp, and the intake slots on the right and top. I intentionally did not place the ALS-1306 next to the K3 because I did not want warm air blowing into the K3. I did ferrite all cables going into and coming out of the amp with Fair-Rite Mix 31 ferrite material. I also added a large ferrite isolator on the amp output as well. Remember this is a KW level amp, so don’t skimp on ferrite material, get that impedance up as high as possible. After plugging things into 220, I hit the power switch– nothing happened! I killed power to the amp instantly, and checked things. All looked good. I reseated the PS cable to be sure things were plugged in tightly, and hit the power switch again– again, nothing happened! Out came the fuses in the PS, both checked out good! I replaced the fuses and hit the power switch yet another time– again, nothing happened, I sat there looking at my new very expensive amp, sitting there with not a light on, and thought– “what a mess this is going to be”, five seconds later the ALC lamp came on, and then a relay clicked, and the LEDs lit up, and the fan started!? I selected 20 Meters on the Elecraft K3, and the amp followed about a second later. I placed the amp in STANDBY and I then carefully tuned the antenna using an LDG-AT-1000ProII autotuner, (see my review here), and got the SWR down to 1:1. I set power out on the K3 to five watts, switched the amp into OPERATE mode, took a breath and hit the tune button. The K3 has a feature whereby one can set the power used to tune the antenna. I have mine set to five watts. So when I hit the tune button I was rewarded by the sound of a relay click, the “TX” green lamp came on, and I was generating about one hundred watts out the back of the amp. I increased the power to ten watts out on the K3, and the ALS-1306 put out about two hundred watts. OK, that worked, so I increased the power on the K3 to twenty watts, and the ALS-1306 put out 500 watts. Being a good ham, I always follow the old adage, “some is good, more is better”, so I upped the power to forty watts from the K3, and got nine hundred out on the ALS-1306, no humming, no dimming of lights, etc., it just sat there putting out nine hundred watts into a dummy load. At nine hundred watts, each amp stack inside the unit is drawing about twenty two amps… The output air was warmer than when it started, but nothing like the old AL-82 used to be… When it put out a KW, you knew it, heat started exiting the amp, the shack air got warm, tubes glowed red, things started humming, and the lights dimmed a bit… The ALS-1306 fan did not even speed up, the amp sat dead quiet, with not a lot of heat leaving it, generating a KW. OK, time to take to to 1.3 KW for a moment… Fifty Eight watts generated 1.3 KW on both the ALS-1306 meter, and the AWM-30 Watt meter, (see my review of the AWM-30 here), I have on the output of the amp, still no real pomp associated with that power level, no hot air rushing out of the amp, it was still quiet, nothing glowing inside the chassis, and the lights did not dim.. OK time to start using the amp. 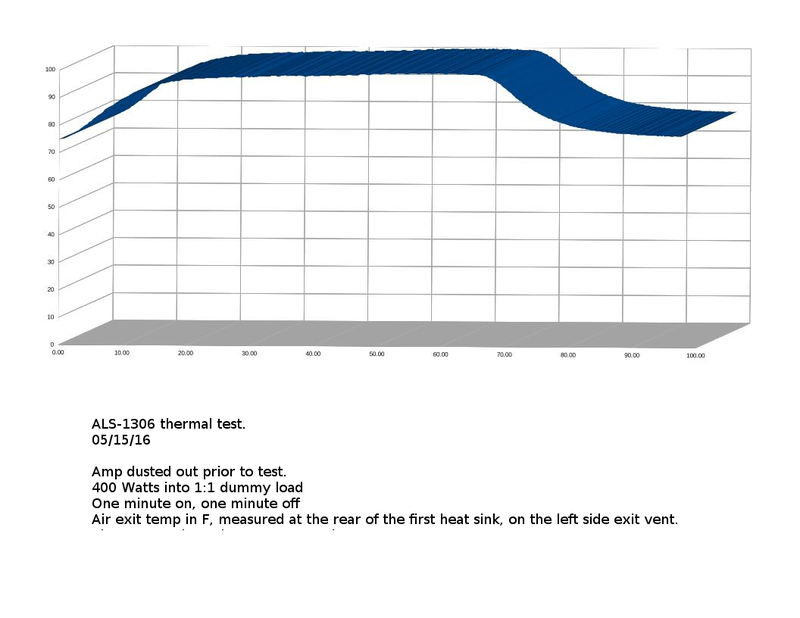 Here are the results of a thermal test I ran on 05/25/16 showing heating/cooling of the amp vs time. Temp is in Fahrenheit on the Y axis, and time is in minutes across the X axis. I ran the amp at 400 Watts into a 1:1 dummy load, one minute on, one minute off. I used WSJT-X to control on and off times. The amp took about twenty three minutes to get to a stable temperature. I held the transmit/receive cycle looking for further increases in temperature. I slight one half a degree Fahrenheit increase took place across the next fifty minutes. I attribute this slow increase to a one half degree Fahrenheit degree rise in ambient temperature. Click the graph on the left for a larger view. ALS-1306 Input power vs. output power. Click to enlarge. Note the odd jump in output power at around 12 watts input on all bands, this is caused by the way my K3 exciter provides calibrated power out. The K3 makes a jump from fine power adjustment to course power adjustment at 12 watts. It is almost impossible to hit 12 watts exactly on all bands. All testing was done into a dummy load, at 1.01:1 SWR. I stopped at either 40 watts, input to the ALS-1306, or 1000 watts output from the ALS-1306. Remember, just because the ALS-1306 can do over 200 watts on 30 meters, does not make it legal. It is not legal in the United States to exceed 200 watts on 30 meters. I sadly packed it up, sent it back to Ameritron, at a cost of about $140.00 with insurance– which still miffs me a bit. Mike said he would turn it around in under a week, (good news), and he did, (more good news), and now I have it back, (even better news). It has been four weeks now, and so far the ALS-1306 is behaving perfectly. No issues of any kind, and the amp is still running well. I have performed a long RTTY chat at 500 watts and all that happened is the air got warm coming out of the amp, which is the best news possible! The customer service was wonderful, I was kept abreast of the status of the amp all along the repair process. MFJ has a ticket system for fixing things, and Ameritron uses that ticket system, and it works very well! I could not be happier with the customer service! I am still miffed it cost me $140.00 and Ameritron did not offer to pay shipping both ways… But in their defense, I did not ask either. in retrospect I probably should have. I had not even thought of 6 meters when an opening occurred and I was able to use the amp on 6. What a dream, if I could hear it I could work it, having 750 Watts on 6, (I did not try and load it fully), CW is really a lot more fun than I thought it might be! I can’t wait for the next six meter opening. I can’t wait to get a 160 Meter antenna up now! This amp is a very nice addition to my station, and I would purchase it again. 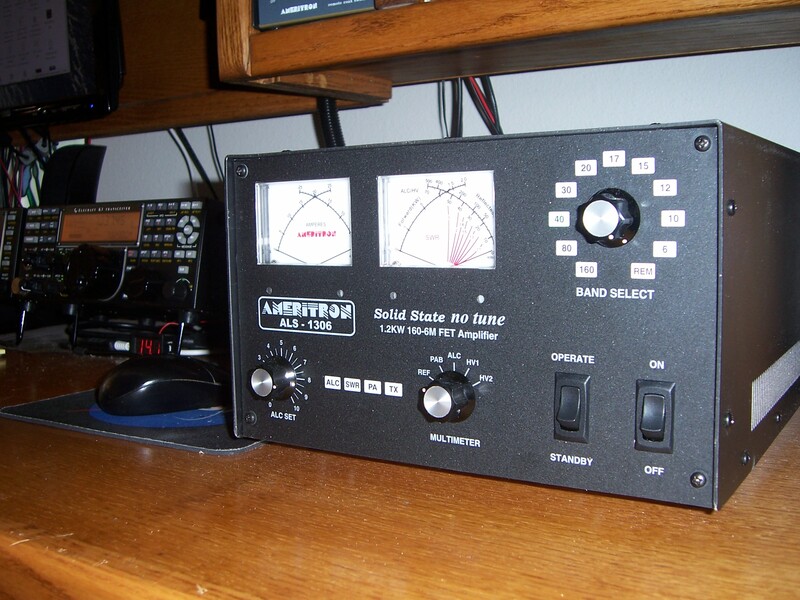 The ALS-1306 is simply a dream to use, virtually instant tune up, almost legal power on SSB and CW, and a good 500 watts on RTTY, at 100% duty cycle. The lack of 1500 watts is not the issue I thought it would be. 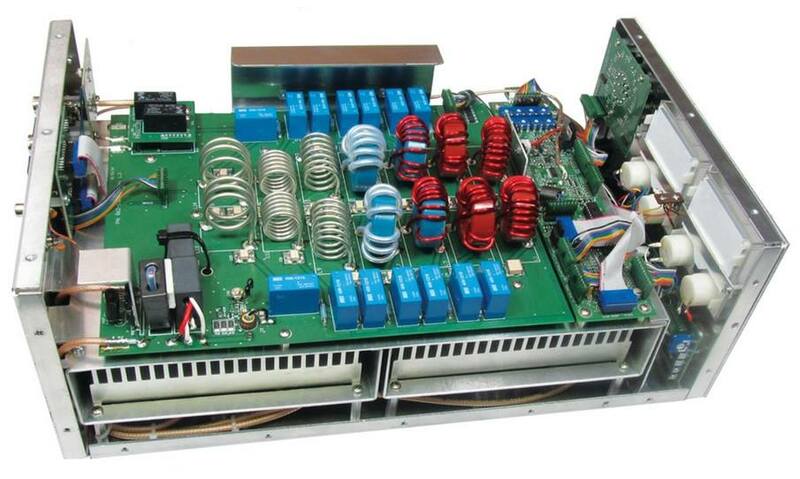 I can not tell the difference between 1200 W and 1500 W, which is not surprising, as it is less than 3 db. I find that I operate teh amp at around 750 watts on CW, 1000 watts on SSB, and 500 on RTTY, or other 100% duty cycle modes. The almost instant on is a very nice feature as well. A five second warm up time, is way better than the six minute warm up time I used to give the AL-82. Yes I know the tubes say 30 seconds is enough, but I was always careful, as the tubes were Eimac, and not replaceable with Eimac devices. Would I recommend the ALS-1306 to a friend– yes I would, and I have!… I am convinced that Ameritron/MFJ simply can’t afford bad PR when it comes to Amps in this class, and in this price range if they want to stay in the amp business, so I expect that they will do right by this amp. 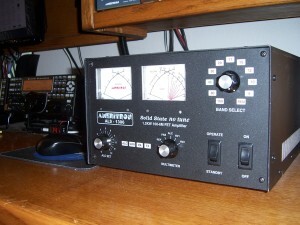 I in fact have recommended the ALS-1306 to a friend, and he has purchased one as well, also from DX Engineering, he is happily using it today. My only real complaint about the amp is that when you turn it on, nothing happens for about 5 seconds… I have had a couple of issues with the amp over the past few years, and in every case, Ameritron has come through with flying colors. I have nothing but good to say about Ameritron service. Again, my only complaint is that when the power comes on, absolutely nothing happens for 5 seconds or so, it makes me think the amp is broken… It isn’t, but it feels odd to throw the power switch, and have absolutely nothing happen, no lights, no meter readings, nothing at all happens… Ameritron needs to add a pilot lamp. I blew a final on my amp– it was my fault, and I sent the amp in for repair. Thinking it would be gone for weeks and weeks, I purchased a backup amp, an Ameritron-811. Two weeks later my 1306 arrived back at my home repaired, and working like a champ! Very quick service from Ameritron! I’ve had 2 Ameritron amps over the years and never had trouble with either. i have an als600 for 2 years and had to return it to replace a blown capacitor, outside that it has been reliable. i toyed with the idea to buy a als1306 until i read some reviews of the same nature which made me doubtful and went with the acom 1500 – so far so good. I purchased the AL-1300 which is basically the same as the 1306 less 6 meters. I had high hopes for it, but I blew a final within 3-hours of operation. Returned it to my vendor and got a full refund. I believe these amps need better protection built into them. The Ameritron failed TWICE in 6 months. MOSFETs in the output. Using 40 watts from ICOM 7300 to Hexbeam. Expensive shipping. One month wait on first repair. No design changes. Forget this amp and get some vacuum tubes–DeForest said that in 1910. Right on. Had my 1306 for 2 years and only problem was the TR relay failed. Ameritron sent new one at no cost. Loved the AMP. In use 2 hrs a day, 5 days a week. Received my 1306 and had to open the power supply and rewire for 120v as per instructions. When I pressed ON smoke poured out. The instructions were wrong. Sent the P.S. in to be properly wired. specs. Key down 1,500 watts into a dummy load thru a Bird and Sierra wattmeter. Coasts along at legal power on long SSB QSOs. The amp doesn’t like more than a small amount of reflected power. All fans are barely noticeable, a lot quieter than on my Dentron kilowatt. Spending twice as much won’t get you more legal power. Was worth the extra trouble. W6IUS WA6TFP KM6HFD.